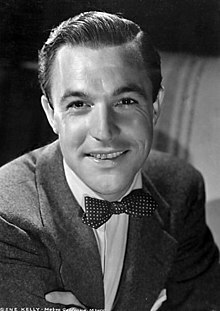 Eugene Curran "Gene" Kelly (August 23, 1912 – Februar 2, 1996) wis an American dancer, actor, sangster, film director, producer an choreografer. He wis kent for his energetic an athletic dancin style, his guid leuks, an the likeable chairacters that he played on screen. ↑ RTE Publishing. "Gene Kelly was proud of Irish roots - RTÉ Ten". web.archive.org. Archived frae the oreeginal on 2014-07-29. Retrieved 2014-10-27. This page wis last eeditit on 25 August 2017, at 01:02.